October is Eat Better, Eat Together Month, a campaign sponsored by Washington State University, the Nutrition Education Network of Washington, and USDA Food and Nutrition Service. 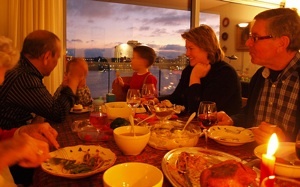 It’s easy for your family to participate: simply sit down at the table and eat together as a family. With busy schedules and other distractions, it can be challenging to get the whole family to sit down for a meal at the same time, but the benefits are enormous. Eating together on a regular basis improves nutrition and communication within the family, and children are more likely to be well-adjusted and do well in school. A Harvard study published in the Archives of Family Medicine’s March 2000 issue showed that eating family dinners together most or all days of the week contributed to a healthier diet. In the study, families eating meals together every day or almost every day consumed less overall fat, more fruits and vegetables and higher amounts of important nutrients (including calcium, fiber, iron and vitamins C and E) compared to families who never or sometimes ate together. When you prepare and eat meals at home, you are more aware of what and how much your family is eating than if you are grabbing take-out or eating at restaurants frequently. You control the quality and quantity of your family’s meals, and you are able to make healthier decisions. Involve your children in meal preparation and planning when you can so they start to contribute to these decisions. Sitting at the table for dinner, without the distraction of the television or cell phones, is the perfect opportunity to talk to your family. You can chat about your respective days at school, work or play, and as your children get older, it will be easier to stay connected to what they are interested in, who their friends are and how they are doing in school. A Washington University study found that preschoolers who eat meals with their families may develop more advanced language skills because they are exposed to longer conversations and new words they may not hear otherwise. In a Harvard study that followed 65 children over the course of eight years, researchers looked at which activities most encouraged healthy child development: play, story time, events with family members and other factors. Family dinners were the most successful factor. How many meals a week does your family eat together? What do you like best about mealtime? Previous: Previous post: Brown Bag Boredom Already? How to keep school lunch interesting.